If she decides to run, the co-founder of the Tea Party Caucus said she would advocate for Christian principles. 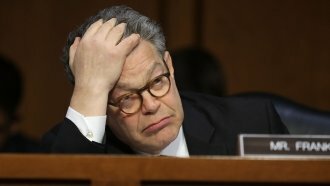 Sen. Al Franken officially stepped down Tuesday — and former Rep. Michele Bachmann may be considering stepping in. Appearing on a Christian television program last week, the co-founder of the Tea Party Caucus said: "I've had people contact me and urge me to run for that Senate seat. ... But there's also a price you pay. And the price is bigger than ever because the swamp is so toxic." Bachmann said she would go back to Washington to advocate for Christian principles, which have largely influenced her post-congressional career. If Bachmann does plan on running for Franken's seat, she may have to start her campaign pretty soon. Minnesota Lt. Gov. Tina Smith is expected to be sworn in as Franken's temporary replacement on Wednesday. She's likely to run in the 2018 special election, and The Hill notes Smith would have "virtually unanimous support" from Democrats.